Aretha Franklin was at the peak of her career and her creative powers when her gospel album “Amazing Grace” was released in 1972. (It sold more than two million copies and became her best-selling record.) Director Sydney Pollack was hired by Warner Brothers to make a film of Franklin’s recording session for this album at the New Temple Missionary Baptist Church in Los Angeles, but Pollack didn’t use a clapperboard to synchronize picture and sound at the beginning of each take, and so he was unable to complete the movie, which sat in storage for 38 years. The footage was handed over to producer Alan Elliott in 2008, and Elliott managed to salvage the project, but then Franklin sued him and prevented him from showing the movie at various film festivals. 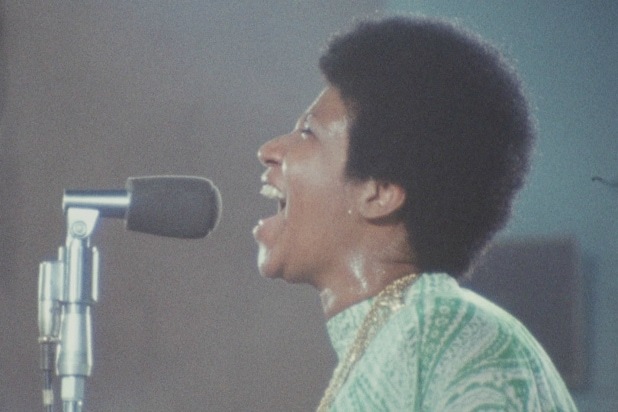 After Franklin’s death this year, Elliott was given the go-ahead by her estate to finally show “Amazing Grace” in theaters, and if anything was worth such a long wait, this movie would be it. “Amazing Grace,” the album, runs an hour and a half, which is close to the running time of this film. (There is a complete version of the concert, recorded over two nights, that was released in 1999 and runs two-and-a-half hours.) We get to hear most of the songs on the original album, but the thrill here is that we get to see Franklin in action in that church. We get to be in the room where this happened, and that’s enough to make “Amazing Grace” the film event of the year. “Amazing Grace” opens with title cards that explain the “technical reasons” why it wasn’t released 46 years ago. We see Pollack trying to figure out how to film at the church, and it becomes apparent later on in this movie that he was in over his head. It looks like he didn’t have adequate time to prepare; late in the film we see him pointing frantically to a cameraman to get the shot he wants. But the gospel personalities on display in “Amazing Grace” are so powerful, so charismatic, so formidable, that many other directors might have been intimidated and lost in their midst. The New Temple Missionary Baptist Church is not a modern mega-church. It is small and plain, but the congregants provide all the flair and drama that anyone might wish for. It is a privilege to be in this space with the Rev. James Cleveland, who leads the concert and is Franklin’s real director and co-star here. Cleveland is a church showman of the old school, and he is highly conscious of the camera. At one point he stops playing for Franklin when she is singing “Amazing Grace” and goes to sit down and weep. Clearly his emotion is genuine, but that doesn’t mean he isn’t aware of using it for effect as a part of the performance. Franklin herself is very private and armored when she isn’t singing, as if she doesn’t want to be seen. There is sometimes fear and apprehension in her eyes during non-musical moments, and she often closes her eyes when she sings. Franklin has the hauteur of a queen when she walks up and down the aisles of the church. She is set apart from others by her gift, and she knows it. What comes across most strongly is how hard she has to try to protect herself and protect the gift she has been given. Mick Jagger is seen clapping along in the back of the church on the second night, and on this second night Cleveland introduces the great gospel singer Clara Ward (who influenced Franklin’s style) and Franklin’s father C.L. Franklin, a small but kingly man she regards with adoration. C.L. addresses the congregation and says that his daughter “synthesized” the styles of Ward and Mahalia Jackson, and it is clear that he viewed Franklin very objectively. Every moment of this movie is extraordinarily pleasurable, but the clear highlight from a dramatic standpoint is Franklin’s rendition of “Never Grow Old,” a gospel standard that she had recorded for her first album when she was a teenager. As she accompanies herself on the piano, C.L. gets up and lovingly wipes the sweat off of his daughter’s face, and when he sits down next to Ward, they both beam with pride and reverence at Franklin. It’s one thing to hear Franklin sing “Never Grow Old” on the “Amazing Grace” album, but it is an otherworldly experience to see her sing it and to watch her father and Ward react to it. Ward starts to cry, but she covers her face. Ward’s mother is so overcome as Franklin sings “Never Grow Old” that she rises up and tries to get to Franklin, and she has to be restrained by others. Cleveland playfully throws a handkerchief at Pollack’s camera as this is going on, and the feeling of ecstatic community steadily intensifies until it seems as if all this could and should go on forever. “Amazing Grace” is a movie worth seeing and re-seeing and re-seeing again, a testament to the Queen of Soul at the height of her powers, live, in full color, in rich sound, resplendent.